On September 14th Paul Walde is debuting a new performative work entitled Of Weather (for Geoff Hendricks). The work was commissioned by the University of Toronto’s Blackwood Gallery as part of the large scale outdoor exhibition Work of WIND AIR LAND SEA curated by the Blackwood’s Director/ Curator Christine Shaw and presented in the Southdown Industrial area in Mississauga Ontario. The exhibition runs from September 14th until the 23rd with the opening from 6pm until 9pm of the 14th. 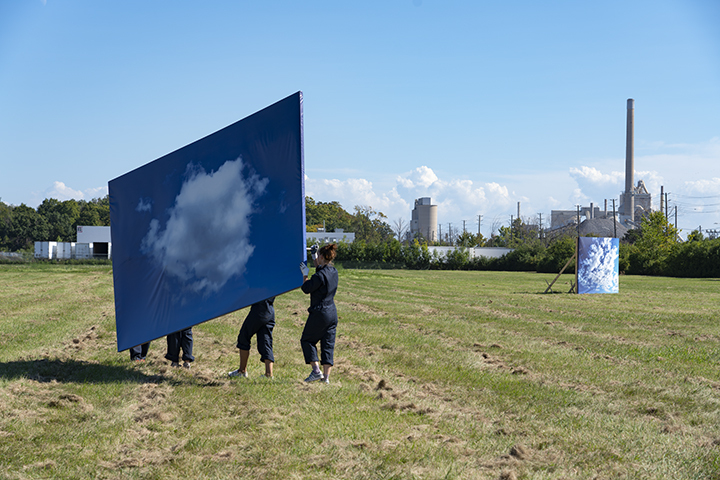 Of Weather is the first of a proposed series of performances called Moving Image Works in which large scale stretched photographic prints (in this case of clouds), are animated by teams of handlers. The performers in Of Weather moved thorugh the Southdown Industrial Area over the course of exhibition coming together a prescribed intervals to performa a choreography of image movements. This ballet of images is build upon standard filmaking camera movements and editing techniques including pans, zooms, tilts, wipes, and cuts. When not roaming the exhibition area, the images form a photographic installation in a radio transmission field.